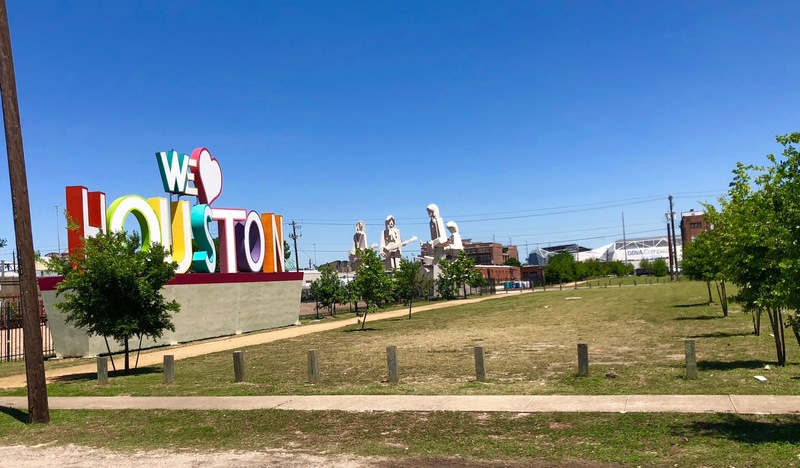 Take a snap of the We Love Houston sign, the Bayou City’s most public display of affection, at its new perch outside of 8th Wonder Brewery. 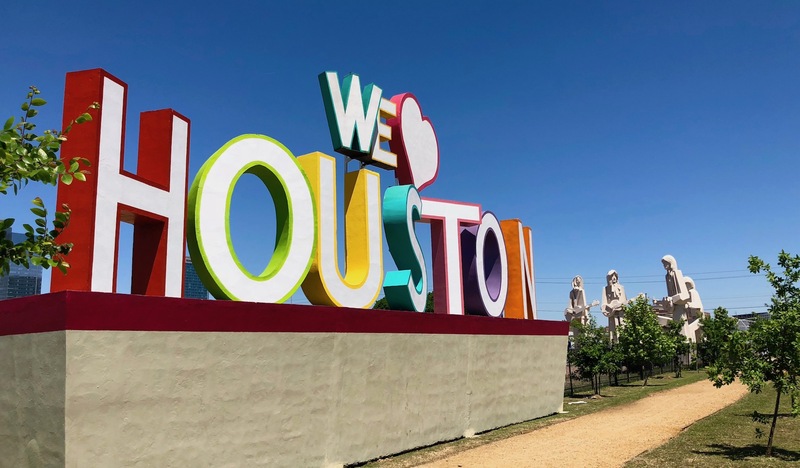 Standing at a whopping 28-feet tall, the We Love Houston sign (sometimes known as the “We Heart Houston” sign) has become a beloved Houston landmark at its previous location, visible from the I-10 freeway adjacent to the Heights. Today, nestled just east of Downtown‘s towering skyscrapers in EaDo, 8th Wonder’s beer garden is the new home of Adickes’ beloved sculptural love letter to the City of Houston. The giant, all-inclusive, three-dimensional love letter to Houston was the creation of David Adickes, the Houston area sculptor responsible for some of Houston’s most larger-than-life public art, including his infamous and prolific President Heads, his giant Beatles statues, his his giant Art Sculpture at Sawyer Yards, and even the 76-foot tall Sam Houston statue proudly on display in Huntsville, Texas. In fact, the 36-foot tall Beatles sculptures, depicting the band during their Sergeant Pepper era, are installed at this location, just inside the brewery. Making the area Houston’s unofficial backyard for all things David Adickes. Adickes originally debuted the sign in 2011, but it remained onsite at his former, informal sculpture staging grounds at Adickes SculpturWorx Studio at 2500 Summer Street, while the slow-going construction along this stretch of the Katy Freeway continued. Though he began his art career as a painter, David Adickes has become beloved in Houston for his beloved sculptures. 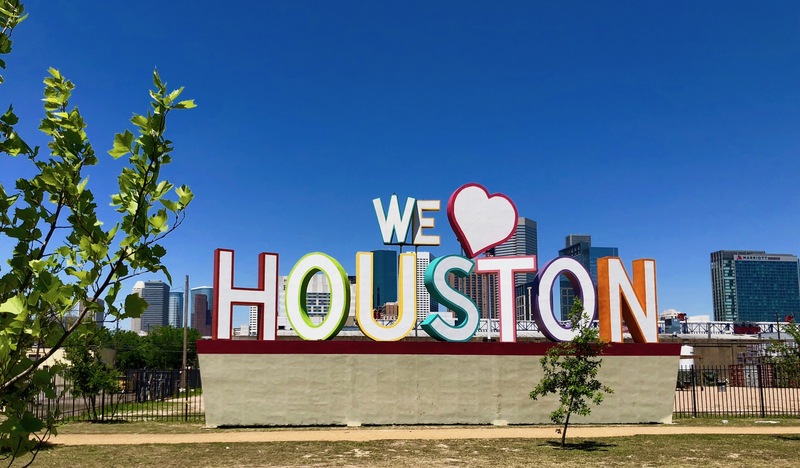 When discussing the inspiration for his We Love Houston sign, Adickes cited iconographic images from both coasts. He said the infamous Hollywood sign was the primary motivation, with an additional influence from the ubiquitous “I Love New York” logo. “I wanted ‘we’ instead of ‘I’ because it’s a shared experience. 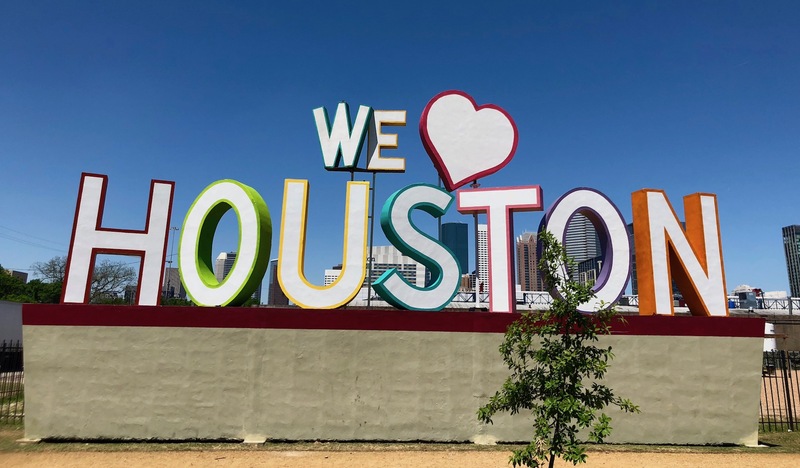 We all love Houston, don’t we?” Adickes told CultureMap. But his individual devotion to Houston remains clear, given that Adickes funded the entire project himself. If you’re looking for a good time to visit the statues and hit the brewery, try a weekday afternoon to catch a less crowded photo-op. Underage visitors are welcome to the brewery as well, though you have to be 21 to purchase beer tokens and drink. Non-alcoholic selections are also available. Also remember that, though the site is free to visit at any time since it is not technically held within the grounds of 8th Wonder Brewery, it is probably best to only visit between dawn to dusk. The statue faces east, away from 8th Wonder, so budding photographers can even catch some of the scenic Downtown skyline in the background of a photo and Adickes’ Beatles Sculpture, too. Hours: Dawn to dusk daily. Brewery hours are from Monday to Saturday 11am to 10pm; Sunday 11am to 6pm; Brewery tours only available Monday through Friday at 7pm.